"Well thought out, and highly recommended." My only previous encounter with Mahan Esfahani’s playing came from his recording of C. P. E. Bach’s “Württemberg” Sonatas (Hyperion 67995). I was unaware that he had any interest in Rameau’s works, or French Baroque harpsichord music in general. It’s something of a specialist’s field. Not every harpsichordist manages the transition across geographical and temporal borders with ease. So I decided to give this album a try, and see if Esfahani brings to the table both an understanding of performance that is stylistically of a piece with other recognized experts in this music, as well as offering something distinctively his own. As chance would have it, I started with “Les niais de Sologne,” that ironic combination of a deliberately naïve theme in the French style, followed by a pair of doubles in the virtuosic Italian manner. Esfahani takes it slightly slower than usual, picks out the bass line with relish, and ornaments both the melody and bass to excellent effect. The variations are performed with ease and great clarity, with the garrulous second holding no terrors for him. Esfahani’s penchant for ornamentation as a trait de caractère appears elsewhere, as well—in “Fanfarinette,” for example, where it marks its subject’s blustering bravery over a firmly articulated beat that is never lost even during pauses between musical phrases. Along with extremely uneven phrasing, it brings out the birdcalls in “Le rappel des oiseaux.” In the more settled, dance-like pieces, such as the E-Minor Suite’s Rigaudons, he is far more regular; and he manages the modest feat of making the rhythm to the First A-Minor Suite’s Courante clear before it is articulated in the bass. The harpsichord used on this release is a large, single-manual Ruckers of 1636, converted to two manuals in 1763. Esfahani lauds the unknown craftsman who did the conversion for keeping the Ruckers soundboard, its supporting rim and case, though some minimally invasive changes were necessary recently due to inept repairs and stylistically unacceptable reinforcements made during the 1960s. The sound in any case is rich and brilliant, sweet and gentle as required, with an especially well-defined bass. 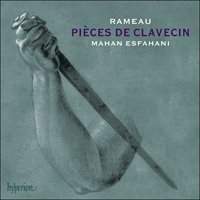 With excellent sound, Esfahani’s version of these Pièces de clavecin rises to the top tier of my list for all Rameau’s harpsichord works—however you define that—alongside Blandine Rannou (Zig Zag 10301). Well thought out, and highly recommended.